With so many gorgeous Chicago summer days, homemade macaroni and cheese is perfect for a quick, kid-friendly dinner. This recipe isn’t as easy as the one from the box, but it’s pretty close. And it tastes a whole lot better. Now you see it, soon you won’t. 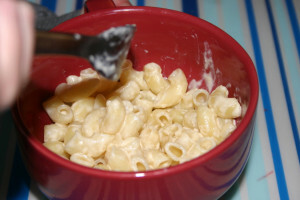 Once you prepare the noodles, melt butter over medium heat. Add milk, sour cream, spice, salt, pepper and cheese and stir until cheese melts. If your cheese clumps and doesn’t melt, try a different brand next time. Leave flame on while you mix the noodles into the cheese sauce. Serve immediately.